Brewed a beer with Georgia & Colorado peaches. We tried to tell the peaches to get out of the way, but they wouldn’t. Ludicrous, we know. Sometime around midnight in a city nobody can agree on, the idea for Terrapin and Left Hand to brew a collaboration beer was born. 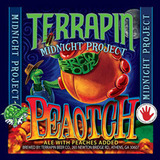 Peaotch is the third in the series of one-time releases between the two breweries. Terrapin Brew master Brian “Spike” Buckowski hosted Left Hand Brew master Ro Gunzel in Athens, Ga and late one night the two brewed up this dreamy ale.